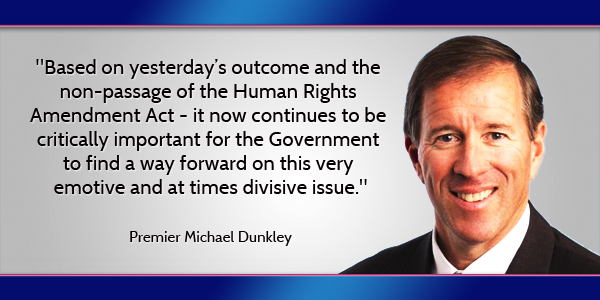 “Based on yesterday’s outcome and the non-passage of the Human Rights Amendment Act, it now continues to be critically important for the Government to find a way forward on this very emotive and at times divisive issue,” Premier Michael Dunkley said. The Premier’s comments follow after Human Rights Amendment 2016 — which sought to maintain marriage as being defined as between a man and a woman — was defeated in the Senate, with 6 Senators voting against the Bill, while 5 voted in favour of it. The Bill was brought forward by MP Wayne Furbert and had already passed in the House of Assembly, however it failed to pass in the Senate with James Jardine [IND], Michael Fahy [OBA], Georgia Marshall [OBA], Jeff Baron [OBA], Lynn Woolridge [OBA] and Kim Wilkerson [PLP] all voting against it. Premier Michael Dunkley said, “Through the course of a very busy day, I was able to listen to some of yesterday’s Senate debate. “I commend all the Senators – Government, Opposition and Independent – for their very detailed and thoughtful presentations. “Based on yesterday’s outcome and the non-passage of the Human Rights Amendment Act – it now continues to be critically important for the Government to find a way forward on this very emotive and at times divisive issue. Premier, if you had not abstained I might have entertained this …. Still trying to force this Bull S! @# after the PEOPLE have spoken!!!!!!!!!!!!!!!!!! The people haven’t spoke if your refering to the referendum since the majority of voters didn’t come out to vote. And yes we are still pushing this because we still want our rights the same as every one else. And if majority came out, it would’ve been a bigger margin. Not voting is a vote. It means, “I don’t care” and one doesn’t care because they think it doesn’t affect them. Therefore, the majority of Bermuda is for Marriage Equality because expanding the rights which you freely enjoy to other has no negative impact on your life. I want my rights to be the same as everyone else’s also… I should be able to smoke my week on my own patio without the harassment of the government and police breathing over my shoulders… And its also great for cooking too..
Then fight for it. Organize. Start a movement. The People haven’t spoken..the referendum did not have enough of a turnout to be valid….Onion Juice do you intentionally lie, as you are well aware of this fact. c) superior to you as a person ? I imagine the majority of posters on this site wish you would never post again, should we throw up a poll? are you willing to stop posting if the majority ask you to? or would you all of a sudden be interested in your human right to free speech? Preach!! Couldnt have said it any better! SSM is not a human right. And yet, we seem to be standing still most of the time. It’s bigger than SSM. It’s a much bigger issue Premier. The question is, are we going to continue to allow faith to drive the political discourse. PM is a nothing more than a religious lobby group. Can we tax churches if they wish to involve themselves in the political discourse, especially when they seek to influence elected representatives? We should instantly disqualify those politicians that refer to their faith when debating in The House. Freedom of religion also means freedom from religion, and The Furbert Sharia Bill is an attempt to force religious will on the community. And he’s too dumb to see that and why it’s dangerous. Sharia? Seriously? I liked your status but you went a bit too far with that one. What’s next? Will they present a bill that demands Creationism is taught in school as a fact? All theories on the beginning are just that, theories. Creationist thinking is no more odd than a Big Bang. Since energy is neither created or destroyed, everything that is here was here from the beginning. So how did the matter get here and why would man differentiate into two separate beings if at one time we were able to procreate without a gender. Evolution makes no more sense than an awesome God as a creator. Given that the “religious right” (both Christian and Muslim) want everyone else to live by the tenets of their religion I thought the label was appropriate. “The Furburt Sharia Bill” is a perfect description, all this fear mongering across the world about Muslim extremism conveniently ignores that Christians have been advocating for Sharia law since man decided to invent the religion. The war on some drugs in the west is just as bad as sharia law if not worse. I wonder if someone would sponsor a “Freedom FROM Religion” Bill? Now that would be progressive. Do you believe religious groups should be prevented from divorcing? Yes or No. Do you believe religious groups should be prevented from having children out of wedlock? Why not just remove 15c and allow folks to get married? Much easier solution. More words from the Premier with nothing behind it. He has not led on this issue and actually part of the reason the referendum failed. If a church sets up that recognizes and wishes to conduct Gay or Lesbian Marriages, then surely Bermuda law as it stands today is preventing that congregation exercising its right to religion. Just throwing it out there to think upon people. We’re talking about the legal construct of marriage and the rights and privileges it affords to people. I reluctantly recognize your wish to drink water in public but you cannot use our water fountains. We will have special water fountains for you. They will be labeled to ensure you do not contaminate our fountains. “Separate but equal” has worked so well whenever it’s been tried elsewhere hasn’t it? It is like what they say in south Asia, same same , but different. The bigots who have chosen to hide behind the argument of “popular majority ” could use a historical reminder . The odious institution of slavery was abolished by elected officials who declared it was WRONG . Popular majority was very much in favor of preserving slavery .